The main question that arises once somebody has ordered a ristretto is – why would somebody choose to order such a small amount of coffee? The truth is, the real lovers of ristretto won’t hesitate to buy themselves a cup of this mini version of espresso because this type of coffee provides a consumer the best qualities a cup of coffee may offer, with extremely reduced imperfections that usually appear as the results of longer periods of extraction. The fact is – the best qualities of coffee beans are the first to come out during the pressure put on coffee in the extraction process. In accordance with this, the longer the extraction procedure lasts, the greater are chances the coffee will be „corrupted“ by some low-quality flavors. Finally, people who decide to have a cup of ristretto are the ones who want to be sure they have minimized the bad qualities of coffee while enjoying the best parts of it. 1 How Did Ristretto Get Its Name And How Strong Is It? 4 What Is Ristretto Nespresso? 5 Why Should You Drink Ristretto? How Did Ristretto Get Its Name And How Strong Is It? The name of this popular version of espresso is actually the Italian word which can be translated as limited or restricted. In Italy, a ristretto is also known as a corto while in the other parts of the world people may refer to it as a short black coffee. When compared to a full espresso, ristretto has a syrupy taste, because of the reduced amount of water and different coffee extraction procedure. Undoubtedly, a double ristretto has a significantly larger amount of caffeine, which makes it really stronger than an espresso. This actually means that the amount of the coffee liquid in ristretto and espresso isn’t the only difference between these two coffees. For all of you who are not really into coffee terminology, the terms of lungo and ristretto may not be too familiar. On the other hand, those who cannot start a day without an espresso probably will know the difference. Although there is a large number of definitions of these types of coffee, the majority of coffee drinkers will tell you a lungo is a larger espresso (because of the doubled amount of the used water), but be careful – if you add the water after the brewing process, you won’t be drinking a lungo! In an espresso lungo, the entire amount of water is brewed and none of it is supposed to be added after this process. Finally, when we speak about ristretto, we’re introducing a condensed variation of an espresso. 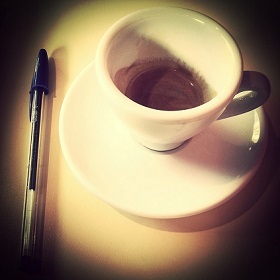 So, if you’ve ever wondered whether there is a coffee even shorter than espresso – the answer to your question is – yes. If you’ve heard people talking about ristretto, you’ve actually heard them speaking about a really short espresso. This means the following – if an average cup of espresso has from 25 to 30 ml, ristretto will not have more than 15 ml of liquid. However, the amount of coffee remains the same (around 8 g per cup), and that’s where the main difference between espresso and ristretto lies. In accordance with this, a ristretto has a significantly more intensive aroma than an espresso. What’s interesting is that there is no specific rule telling us how much coffee is required for any of these types of espresso. However, what’s widely known is the fact one ristretto makes a half of an espresso and a quarter of a lungo which basically means the amount of water used for an espresso coffee is the doubled amount of water needed for ristretto. When it comes to the steps of ristretto preparation procedure, there are no significant differences when compared to espresso: pouring, timing, and beans grinding are the crucial activities in the process. Depending on the equipment you have, you can make a ristretto in several ways. Even though the truth is some of the methods provide a really good ristretto and the other ones don’t always, there’s no doubt anyone can easily prepare it. This method is not chosen to be explained before all others without a reason. Known as the best method of ristretto preparation – since it is the traditional one, this process includes brewing 30 ml of coffee with the pour time remaining the same as the pour time required for a standard cup of espresso. First, you will have to set your grind in order to provide finer ground coffee beans when compared to a regular espresso, because your goal is to reduce the extraction’s pour rate. Once you’ve adjusted the grind, measure around 14 g of coffee and put it in the basket. The final step is to prepare and tamp the coffee paying special attention to the timing of the extraction. In less than half a minute (in 25 to 30 seconds, more precisely), you will get 30 ml of liquid and that’s exactly what you need for two cups of great ristretto coffee. Even though it’s a common way of ristretto preparation because it represents a faster way of doing so, this method should be avoided whenever it’s possible because it doesn’t provide as perfect taste of coffee as the first, traditional method. However, this method is useful for all of you who try to prepare your ristretto on an espresso machine based on the pressurized filters. When it comes to these machines, the problem of not having enough control to handle the first method is solved by this shortcut technique that may come pretty convenient. When you prepare ristretto using this method, you start the procedure by adjusting your grind as fine as the machine allows and tamp as usual. Once you have it started, the extraction should last until it produces around 30 ml of coffee, which is enough coffee for an espresso (a double ristretto). The disadvantage of the second method. The reason why this procedure is not really a recommended way of producing a ristretto is the fact it only gives an espresso which is half-way stopped. This means the texture and the taste of the produced coffee won’t be as syrupy and dense as the texture and the taste of a real ristretto. 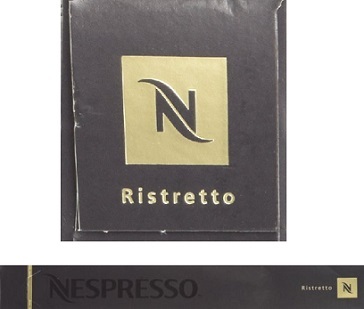 Ristretto Nespresso is a product originally offered by NESCAFÉ Dolce Gusto company in the form of capsules filled with high-quality traditional coffee and Ristretto Nespresso is only one of the numerous types of capsules produced by this company. These handy coffee containers can be used on your home machine. Lately, numerous other coffee producers beside NESCAFÉ have started producing those capsules offering a wide variety of ristretto capsules made of coffee with different origins and aromatic profiles. Why Should You Drink Ristretto? There is a list of some pretty interesting conditions that are said to be easily solved by the consumption of ristretto coffee. For example, ristretto coffee may be a good helper in dealing with weakened immune system. In addition to this, it is considered as an efficient stress reducer which may also help you stay awake and productive. However, you should be warned that ristretto, like other stronger coffees, may provoke some side effects if you drink it excessively so be careful and stay within the limits of the normal consumption. The modern ristretto has a lot of variants so don’t be surprised to hear about ristretto bianco or afraid to taste a ristretto based on hazelnuts, vanilla, and numerous other flavors offered by the leading coffee producers beside the authentic ristretto. You may enjoy ristretto with a bitter, fruity and intense espresso aroma but chances you’ll find a ristretto enriched with milk are pretty low. Even if you have the rare option of adding milk in your ristretto when ordering it in a café, you’ll only get a couple of milk drops, since milk may spoil its recognizable strong taste. This type of ristretto, which is not diluted into a larger cup of milk or water, is also known as a straight ristretto. Once you dilute your ristretto in the mentioned ways, you get some other types of coffee. A ristretto diluted into a cup of water will give you a long black coffee also known as an Americano, while ristretto mixed with milk creates latte and cappuccino, which are milder and less bitter variants of coffee when compared with the original, straight ristretto. Ristretto is always served hot, usually in a small ceramic cup and it is perfectly combined with some biscuits or vanilla ice cream.